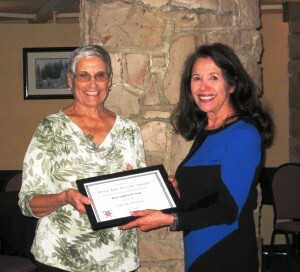 The Betty Ann Prescott Award was introduced by the Bear Valley Ski Club in 2012 in honor of founding club member and supporter Betty Ann Prescott. Each year the Ski Club will present this award to a long-time member of the Ski Club who has served the club through its many projects, has provided leadership in various capacities, and has been an inspiration to our members. The person must be a current member of our club. Each year the Ski Club seeks nominations from our members for a current member who is deserving of this award. The award is announced and presented at our Annual Winter Dinner-Dance in January. 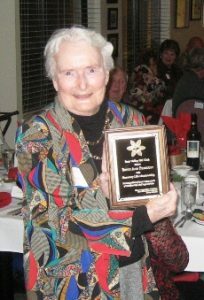 Betty Ann was awarded the Ski Club’s Honorary Ski Club Member Award at our club’s Annual Winter Dinner Dance in January 2011. She was one of the original members of the Bear Valley Ski Club. Early in 2011, Betty Ann wrote down her memories about our Ski Club in its early days which can be read on our Memories web page. Betty Ann passed away in October 2011. 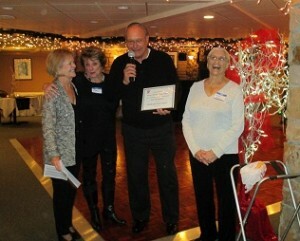 The first Annual Betty Ann Prescott Award was announced at our Annual Winter Dinner Dance on January 20, 2013. After deliberation on the nominated candidates, the Ski Club presented Carole Brown, our club’s travel chairperson, with this first award. Carole has organized our Annual Ski Trip, both international and North American, for the past 20 years, and does a fantastic job! Our ski trips are great fun for all — skiers, boarders, and non-skiers! Thanks, Carole, for all of your help and work these past many years. 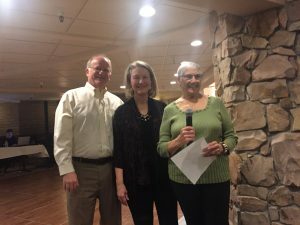 The second Annual Betty Ann Prescott was awarded to Chuck and Robin Taylor at our Winter Dinner Dance on January 19, 2014. The Taylors, along with the Prescotts and others, comprised the first members of the Bear Valley Ski Club and have been active in our club since its inception in 1966. Chuck served several terms as club president and Robin was the club historian. Together they started the Buddy Werner Ski League for kids and Kyle Rasmussen was an early member of this program. They also started the once a month family fun ski races which prompted many of our Ski Club members to race in NASTAR and the Equitable Family Ski Challenge. Chuck and Robin started the “Beer and Pop” races at the mountain. Chuck was active in the Far West Ski Association, and he held clinics at the mountain to certify many of our club members as race officials. Because of Chuck and Robin’s devotion to our Ski Club, the Bear Valley Ski Club had the reputation of hosting the best races in the western states! We are pleased to celebrate this wonderful couple for their team work together to make our club what it is today! 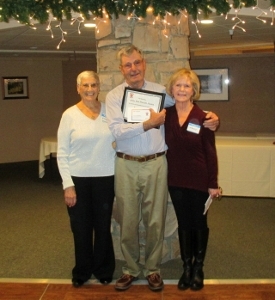 The third Annual Betty Ann Prescott Award was awarded to Paul Meyer at our Annual Winter Dinner Dance on January 25, 2015. 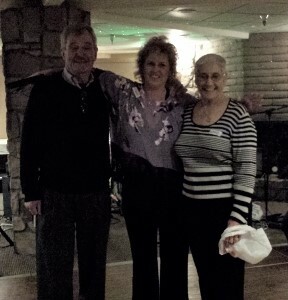 Paul and Ethel joined the Ski Club in 1985 and have been active members since — 30 years! Throughout these years, Paul has served and continues to serve the club through its many projects, has provided leadership in various capacities, and has been an inspiration to our members. Paul has served our club in many board positions, including President, Vice President, chairperson of the Ski Sale, chairperson of the Golf Tournament along with Ethel, chairperson of the Family Ski Race, and other capacities. As we all know, we can count on Paul for “always being there” for anyone who needs a helping hand (or truck)! We thank Paul for all that you are and have been for the Ski Club, and in recognition of your dedication, many years of membership, and loyal service to our club! At our Annual Winter Dinner Dance in January 2016, our fourth Betty Ann Prescott Award was awarded to Casey Valverde. Casey has been our Social Chairperson organizing our many annual events, including the Ski Sale, Winter Dinner Dance, July Picnic, Season Kickoff Potluck, and others. Many thanks to Casey for all of her work and efforts in organizing the many Ski Club events that we all enjoy! And she acts as if it’s all a piece of cake! We couldn’t have our successful Ski Club without her!!! At our Winter Dinner Dance in April of 2017 the fifth Betty Ann Prescott Award was presented to Pat and Bert MacDonald. Pat and Bert have been members of the Club since the beginning and during that time they have held almost every position imaginable. Pat originated the original printed “Paw Print” newsletter, started the first Ski Swap (when it was truly a swap with members selling what they had outgrown and buying ski equipment that others had determined to be surplus). Pat also put together ski trips to Sun Valley and Banff, all the while supporting their children’s race team at Bear Valley. Bert was President of the Club and set up several Cross-Country group outings during the early years. An innovative approach involved getting permission from Bear Valley Ski Area for members to wear cross-country skis on the lift for a one way ride to the top without a trail pass. The 2018 Betty Ann Prescott Award was presented to Ric Havens and Vicki Bohan. This year’s choice was met with overwhelming enthusiasm by the Ski Club members in attendance at the 2018 Dinner Dance held on January 21st, 2018. Ric and Vicki have been members of the Ski Club since retiring as Bear Valley Race Team parents. Ric held the position at Treasurer for a 7 year period during which he was able to turn a sow’s ear into silk purse by managing the budget with lower income due to the cancellation of several ski sales and higher than normal expenditures. Due to his diligent financial management the club sailed along as smoothly as ever. Vicki has been the force behind the Club’s website and the email newsletter that are ever so important in keeping the current membership and prospective members fully informed on the Club’s planned activities. Without Vicki’s thorough knowledge of the programming languages and required website design programs our club, she brought us into the computer age without our even know it. A fabulous contribution by Ric and Vicki and a very well deserved award. 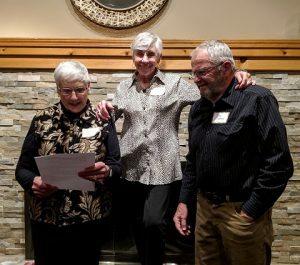 The 2019 recipients of the Betty Ann Prescott Award, Don and Linda Trefry, are not only long time Ski Club members but have been very instrumental in bringing in many new members just by their enthusiasm and interest in skiing. Linda was the more active one on the Board, since she was President and spent many years sharing Social with Pat MacDonald starting the ski swap (when they also had a hot dog sale and were responsible for the food) and the food for all the dinners that they were in charge of. In the 1990s, they teamed with Rick Van Aken to establish an adaptive ski program at Bear Valley under the National Handicapped Sports. The program grew over a period of years to help the blind, mentally challenged, people with missing limbs and paralyzed children and adults. Don was a natural born skier! His enthusiasm was responsible for pushing many of his friends to ski the more difficult runs than they had before. He would climb up the top of Mt. Reba, ski down and end up at the bottom of Grizzly! One time when he and Bert MacDonald skied down to the bottom of Grizzly, the lift was closed, and they had to hike back up to the Lodge. That was probably a little more than they wanted to do that day but we’re sure when they got to the lodge bar, they were able to sooth their weary bones! After the award presentation, several Ski Club members and the Trefry’s daughter told stories about Linda and Don and their enthusiasm for our Ski Club and for skiing. Congratulations to a well-deserving couple!